Uncommon map of North America showing California as an Island. Americque Septentrionale. Par le Sr. Sanson d'Abbeville Geograph du Roy. A very attractive 1662 Nicolas Sanson map of North America. Sanson's map covers all of North America from Baffin Bay and Greenland, south to include all of Central America, the West Indies, and parts of the Spanish Main, it similarly extends from California eastwards to the Azores and the British Isles. 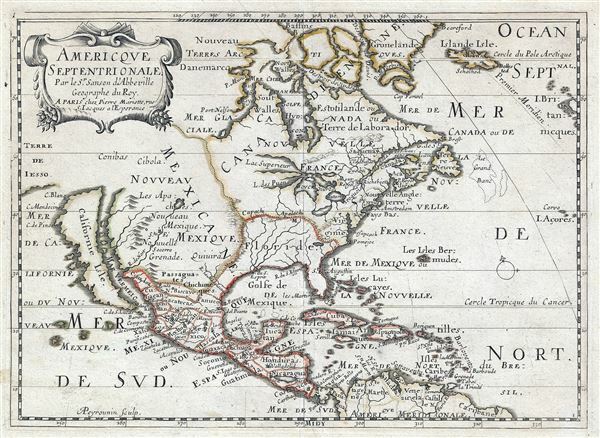 Cartographically, this map is a reduced version of Sanson's own larger 1650 Amerique Septentrionale. Baja California was subsequently discovered in 1533 by Fortun Ximenez, who had been sent to the area by Hernan Cortes. When Cortez himself traveled to Baja, he must have had Montalvo's novel in mind, for he immediately claimed the Island of California for the King. By the late 16th and early 17th century ample evidence had been amassed, by explorations of the region by Francisco de Ulloa, Hernando de Alarcon and others, that California was in fact a Peninsula and not and island. However, by this time other factors were in play. Francis Drake had sailed north and claimed 'New Albion' near modern day Washington or Vancouver for England. The Spanish thus needed to promote Cortes' claim on the 'Island of California' to preempt English claims on the western coast of North America. The significant influence of the Spanish crown on European cartographers caused a major resurgence of the Insular California theory. Shortly after this map was made Eusebio Kino, a Jesuit missionary, traveled overland from Mexico to California, proving conclusively the peninsularity of California. Further inland the mythic cities of Conibas, Quivara, and Cibola are identified. The latter two of these, Cibola and Quivara, are legendary cities of gold whose first documentation hails from the misadventures of Cabeza de Vaca and the explorations associated with the Coronado Expedition. Conibas is another mythical city, presumably situated on a lake high in the Canadian arctic, whose origins most likely trace to the Cartier Expedition. Cartier, it is said, noticed Indians trading with shells, wampum, which they called Conibatz. This later transliterated to Conibas. In the province of the Apaches, roughly in the vicinity of modern day Great Salt Lake, a large lake appears from which the Rio de Norte (Colorado River) extends southward to drain into the Gulf of California. (Although the Colorado technically does flow into the Gulf of California, it has not done so on a regular basis for over 100 years.) Several identifiable cities appear along the river, including Santa Fe. Further east still, the Great Lakes are presented in an embryonic form. The lakes Michigan and Superior extend westward indefinitely suggesting that they may in fact connect to the unexplored Pacific Northwest coast. Of the five lakes, only Lake Erie is unnamed - though it is repressed with a close approximation to accuracy. On the eastern Seaboard New York or New Amsterdam, is presented as an island well offshore. Plymouth and St. Augustine are also identified. Nicolas Sanson issued this map to accompany his 1662 atlas of America entitled L'Amerique en Plusieurs Cartes. This map is known in six states, of which the present example corresponds to Burden's second. It was engraved by Abraham Peyrounin. Abraham Peyrounin (1641 - 1694) was a French map engraver active in Paris during the latter half of the 17th century. His work is primarily associated with the prolific map firm of Nicolas Sanson and Pierre Mariette. His imprint typically appears as APeyrounin. Sanson, N., L'Amerique en Plusieurs Cartes, (Paris) 1662. Burden, P., The Mapping of North America II, #324. OCLC 159862751.